Are you a first-time car buyer on a tight budget? Toyota will answer the bell with the debut of the 2020 Toyota Yaris Hatchback. A modern take on the subcompact Toyota Yaris Hatchback, the all-new variant promises to add a more spacious cabin, next-generation technology and a bold style that pair with an affordable price tag. Learn more about the next-generation Toyota Yaris Hatchback with this review of the 2020 Toyota Yaris Hatchback release date and design specs. When Will the 2020 Toyota Yaris Hatchback Be Available in Bangor? A fun-to-drive subcompact hatchback, the 2020 Toyota Yaris Hatchback is expected to arrive at Downeast Toyota later this year. When it arrives, the Toyota Yaris Hatchback will be available in two mono-spec trim levels – LE and XLE – that feature a broad range of features to create unrivaled value. Measured at 161.6 inches long, the Yaris Hatchback possesses a 32.2-foot turning circle that is perfect for your next urban adventure. Armed with a wheelbase that is 2.4 inches longer than its predecessor, the 2020 Toyota Yaris Hatchback provides more interior space and 15.9 cubic feet of cargo space. Budget-minded car shoppers who choose the 2020 Toyota Yaris Hatchback will discover an impressive list of standard features. Yaris Hatchback LE entries come standard with 16-inch alloy wheels, body-color exterior accents, a chrome tailpipe, power-adjustable side mirrors, LED turn signals, Toyota Smart Key with Push-Button Start, a rearview camera and a first aid kit. 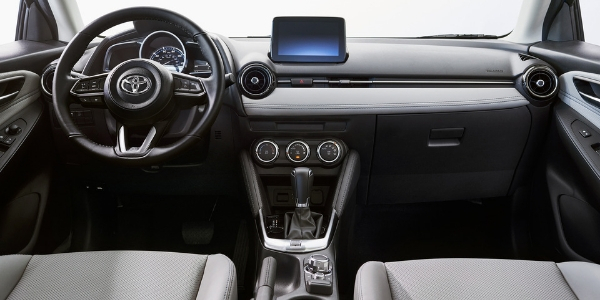 A 7-inch Toyota Entune™ 3.0 touchscreen infotainment system is a standard fixture and provides access to Apple CarPlay, Android Auto and Bluetooth. The standard Low-Speed Pre-Collision Safety System is an added asset that will upgrade safety. When you slide into the driver’s seat of the 2020 Toyota Yaris Hatchback, you will cut down on fuel costs with a fuel-efficient and fun-to-drive powertrain under the hood. Toyota Yaris Hatchback entries are equipped with a 106-horsepower 1.5-liter four-cylinder engine that is paired with a responsive six-speed automatic transmission. With this combination at your disposal, the Toyota Yaris Hatchback is expected to achieve an EPA-estimated 40 mpg on the highway. The addition of a driver-selectable Sport Mode will amplify your day-to-day commute in the Bangor area. 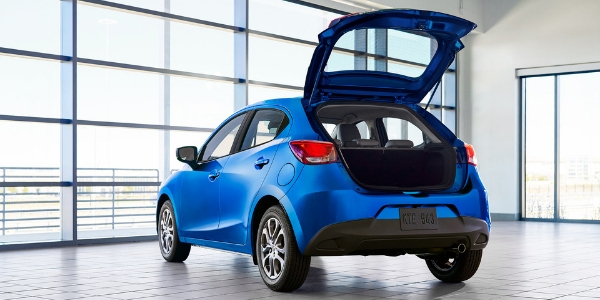 Are you interested in an affordable, athletic and attractive subcompact hatchback? Look no further than the updated 2020 Toyota Yaris Hatchback. Learn more about the latest Toyota Yaris edition with this brief overview of the 2020 Toyota Yaris Hatchback release date and design specs. Visit the Downeast Toyota inventory later this year to get behind the wheel of the 2020 Toyota Yaris Hatchback! What Are the Best Toyota Vehicles to Spend Your Tax Return on at Downeast Toyota? Find an All-New Toyota Yaris Sedan Trim Level That Will Fit Your Lifestyle and Budget! New 2018 Toyota Yaris Set to Arrive at Dealerships in Spring of 2017! This entry was posted on Monday, April 15th, 2019 at 2:23 pm	and is filed under New Toyota Models, Toyota Yaris. You can follow any responses to this entry through the RSS 2.0 feed. You can skip to the end and leave a response. Pinging is currently not allowed.